UnityPoint Health – Fort Dodge recently had the honor of hosting United States Secretary of Health and Human Services Sylvia Burwell at Trinity Regional Medical Center. The visit on July 14, 2016 was an hour-long round table discussion focused on the successes of the Pioneer ACO and how it has helped improve coordinated care in the Fort Dodge region. The UnityPoint Health System Services and Fort Dodge teams enjoyed hosting the Secretary and more importantly, showing the transformation that occurred for their region and patients. HHS Secretary Burwell took to the road in July to visit three cities across the country to talk about how the Affordable Care Act has provided new tools to help build a health care system that puts patients at the center. 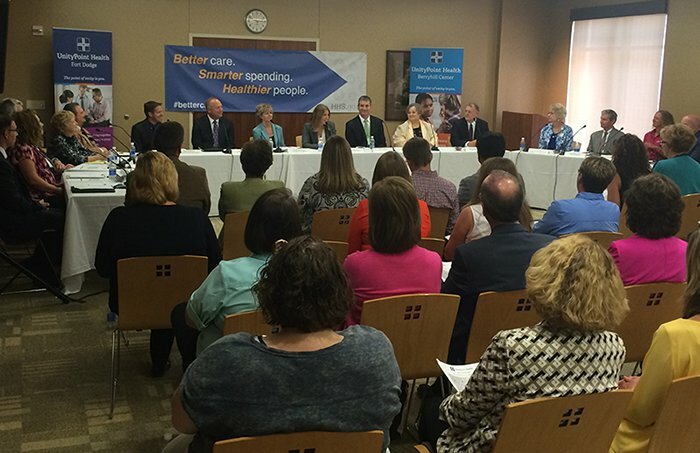 The Secretary made stops in Fort Dodge, Iowa, Cleveland, Ohio, and Jacksonville, Fla., to highlight how several health systems are working to deliver better care, and how patients are benefiting from those changes. A UnityPoint Clinic patient in the Fort Dodge region, Pam Matthews, shared a story of very positive changes in her health care as part of the conference. Respect, coordinated care and a team atmosphere helped Pam get her diabetes under control. And because Pam has a voice in her care, she's no longer in denial about her diabetes. You can read more about Pam's story on the Health and Human Services website (HHS Blog).